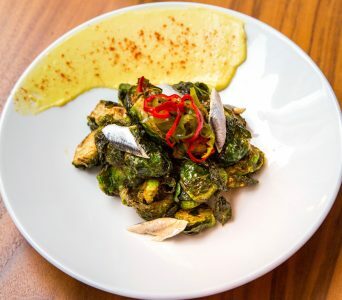 Brussels sprouts have been on the Heartwood menu since day one. Initially, they were largely served as sides, albeit in multiple ways. So popular was one of these executions that it moved from beyond just best supporting actor to a starring role in our bar snacks program. Those Brussels sprouts—tossed in an umami-rich sauce and topped with a kick of peppers—also happen to make an ideal Thanksgiving Brussels sprouts recipe. Luckily, Chef Varin Keokitvon, the sprouts’ creator, is good at sharing. 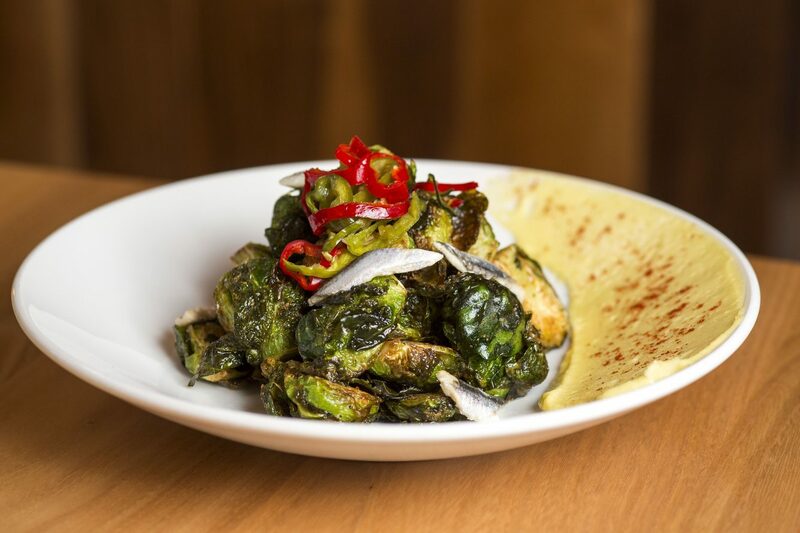 Fried in beef tallow and tossed in a homemade laab dressing, Chef Varin’s Brussels sprouts are at once crispy and funky. For the home chef, the beauty of these sprouts is how easy they are to make. While Chef Varin has the luxury of both pounds of beef tallow and a deep fryer at his disposal, neither is necessary. The Brussels sprouts can be fried in tallow, any sort of animal fat, or even canola oil. Or, they can be quickly roasted in the oven at very high heat. Whether you’re after a special Thanksgiving Brussels sprouts recipe or a Tuesday night staple, these sprouts deliver. To make them, simply slice the sprouts in half, toss them with a bit of seasoning, and deep-fat fry or roast. Once the sprouts turn crispy on the outside pull them from the oven or fryer, let them rest briefly, then toss them in homemade fish sauce-based laab dressing. Season: Toss in a homemade dry seasoning of powdered garlic, powdered onion, salt, black pepper, and Spanish \paprika, or something like Trader Joe’s Seasoning Salt. Deep fry or toss in tallow, animal fat, or canola oil and broil on high for 8 to 15 minutes or until charred and crispy. Remove sprouts from pan, let rest briefly, then toss in laab sauce. Top with white Spanish anchovy and sliced pickled pepper rings. Serve with lemon aioli if desired. Chop preserved lemon. Combine lemon and all ingredients through mushroom seasoning in a food processor and process until smooth. With machine still running, drizzle in olive oil and process until emulsified. *We use no MSG at Heartwood Provisions, so this mushroom powder provides added umami. You can omit it, replace it with a dash of soy sauce, or find a dried mushroom powder at your local grocery.